Fish fries are a great tradition around the country to bring together family and friends. During the season of Lent, Friday night fish fries are especially popular for those abstaining from meat. Take a look at Steve Rinella's step by step process in this video and get lots of tips for doing it at home. For the marinade, in a large bowl, whisk the spices into the buttermilk until mixed. Add the fish into the marinade and cover. Let the marinade sit for four hours, or up to 1 day, covered with plastic wrap. Prepare the fryer to a temperature of 375 degrees. For the breading, mix all the ingredients in a large bowl. One piece at a time, press the fish into the breading and pat the crumbs onto the side and then flip the piece and do the same to the other side. The entire fish should be covered with crumbs. 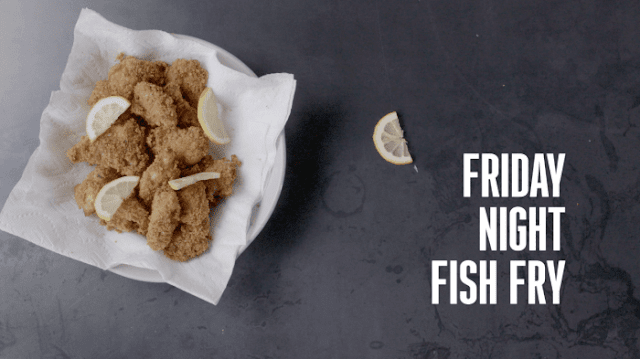 Place the breaded fish on a plate in preparation for frying. When all the fish has been breaded, carefully place each piece into the fryer in a single layer with space between each piece. Be careful not to overcrowd the fryer. Cook for 3 or 4 minutes until fish is golden brown. Remove and place on a paper towel covered plate to drain. Serve immediately. For the Tartar Sauce, add all of the ingredients into a bowl and whisk until incorporated.